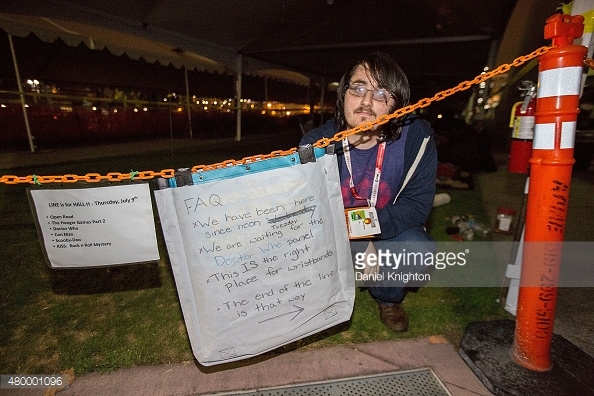 Jason Kaus at Comic-con 2015. 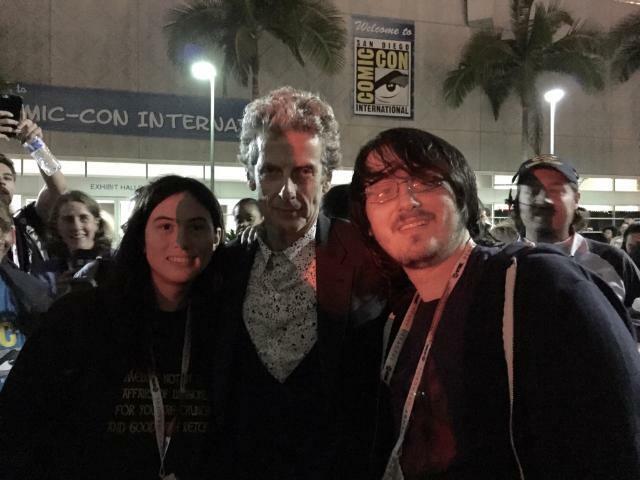 He was first in line for Hall H and visited by the Doctor. Fifty years ago today John F. Kennedy gave the greatest speech of my lifetime. There were televisions in each classroom at El Rodeo Elementary School and we all watched the inauguration, the first one we had ever seen. Many people who I have met say the same thing happened at their schools. I have often wondered what caused school administrators to set this up as it had never happened before. JFK was young even to me, and I was 12. As I heard Peggy Noonan say on the radio yesterday, we did not know that a president could be our parents’ age rather than our grandparents’ age or that he did not have to have grey hair. The day seemed historic even at the time, from Robert Frost’s inability in the glare to see the text of the poem he had written for the occasion to the soaring rhetoric and almost comical dress clothes. The speech apparently was largely written by Theodore Sorenson, who died just last October. I memorized it for our 8th grade speech contest and I can still do a pretty good job today, somewhat to the annoyance of my family. There are many critiques of Kennedy’s short period in office, but that day created a spirit of hope and aspiration that those of us who saw it will never forget. It is worth watching. Only 14 minutes long. The borrowers in this case tell a sad story of mistakes and obtuse responses, compounded by an assignment of the loan to GMAC in the middle of the problems. Borrowers purchased a home in June 2003 and obtained a 5.5% 30 year fixed loan from RBC Mortgage Company, which would set most people on a happy course. However, unknown to the borrowers, RBC miscoded the loan so that the first payment was due in July, rather than in August, which was the correct date. This set off a daisy chain of errors, returned and mis-credited checks and miscommunications. While the home was in a slow-motion foreclosure process, with several payments being made, some of which were correctly credited, RBC assigned the loan to GMAC. GMAC continued to send incorrect communications, including demands for payment and reports of renewed assignment for foreclosure and alleged delinquency reports to credit agencies. In 2005, through the intercession of HUD, the financial issues were resolved, with the borrowers not paying any fees or penalties. Borrowers sued under 12 U.S.C. 2605(e), which requires a loan servicer to acknowledge and respond to a QWR that requests information or states reasons for the borrower’s belief that the account is in error. The QWR must include the name and account of the borrower or must enable the servicer to identify them. Within 60 days after receiving a QWR, a loan servicer must (1) make appropriate corrections to the borrower’s account and notify the borrower in writing of the corrections; (2) investigate the borrower’s account and provide the borrower with a written clarification as to why the servicer believes the borrower’s account to be correct; or (3) investigate the borrower’s account and either provide the requested information or provide an explanation as to why the requested information is unavailable. The servicer must provide a name and telephone number of a person who can assist the borrower. The borrowers contended that five written communications they had sent were QWRs. The Court of Appeal agreed as to two, one of which was relayed through HUD, finding that they adequately reported an error in the account that triggered the response requirement. The other communications merely stated requests for handling of the loan, but did not adequately request information or report errors. The District Court had found that GMAC qualified for a safe harbor based on its eventual correction of the account records, but the appellate court found that GMAC did not properly “notif[y] the person concerned of the error” and therefore did not qualify for the safe harbor. •reinstated the borrower’s breach of contract cause of action. The District Court had agreed with GMAC that the borrowers themselves had first breached the contract by failing to make payment, although GMAC had refused to apply the checks that the borrowers had sent. The appellate court felt that a reasonable jury could conclude that borrowers had done their best. •Agreed that no tort could be stated. Under the economic loss doctrine, there can be no tort recovery for economic losses based on failure to perform contractual obligations. •Found that borrowers had adequately stated recoverable damages based on rejections of several loan applications, including three loans at LaSalle Bank. (“We are not quite done yet,” the Court states on page 36 of its opinion) Although a LaSalle loan officer testified that the loan applications would have been rejected regardless of the issues in this case, borrowers were permitted to introduce a statement by a LaSalle loan officer told her that borrowers’ loan applications would not be approved until their foreclosure was removed. GMAC contended that this was “classic” hearsay, but the Court found that the statement either was not hearsay because it was a statement of the bank’s intentions or was admissible under the state of mind exception. In an opinion that is based on a literal reading of California’s mediation confidentiality statute (Evidence Code §§1115 et seq. ), the State Supreme Court unanimously held in Cassel v. Superior Court (1-13-2011) __ Cal 4th __ that a client cannot use his attorney’s bad advice during a mediation as evidence in a subsequent suit for malpractice. The mediation statute means what it says that “[a]ll communications, negotiations, or settlement discussions by and between participants in the course of a mediation . . . shall remain confidential.” “Participants” means everyone, lawyers included. Nothing in the statute, the Court holds, provides that communications must involve the actual parties or the other side of the dispute. The opinion, which overrules a contrary decision in the case by the Court of Appeal, but is consistent with an intervening U.S. District Court case authored by Magistrate Judge Elizabeth Laporte (Benesch v. Green (N.D.Cal. 2009) 2009 WL 4885215), spends most of its thirty two typed pages parsing the language of the statute to fend off various constructions offered by Cassel’s attorneys to allow admission of private communications between a client and his attorney. Although the attorney-client privilege has an exception for litigation between attorney and client, the Court finds no basis to adopt an analogous exception for mediation confidentiality. The attorney is a “participant,” who is as entitled to confidentiality as the client. The Court cites its past decisions that established a strong mediation privilege without court-made exceptions, unless a parties due process rights were threatened. In previous cases, the Court has refused to allow mediators to report that parties had not participated in good faith (Foxgate Homeowners’ Assn. v. Bramalea California, Inc. (2001) 26 Cal.4th 1. ), refused to allow a “good cause” exception for writings prepared for a mediation (Rojas v. Superior Court (2004) 33 Cal.4th 407) and required that a settlement agreement reached at a mediation contain specific words that it was intended to be binding and enforceable before it can be used in an enforcement proceeding (Fair v. Bakhtiari (2006) 40 Cal.4th 189. Although there are exceptions provided in the statute when all of the participants agree to waive confidentiality, judicial principles such as equitable estoppel and implied waiver do not apply to mediation confidentiality (Simmons v. Ghaderi (2008) 44 Cal.4th 570). In all of these cases, as here, the Court read the statute quite literally. The only recognized exceptions are waiver by all parties and to avoid a due process violation. The due process exception, does not apply when the evidence is needed in civil litigation. The Court distinguishes Rinaker v. Superior Court (1998) 62 Cal.App.4th 155, where mediation confidentiality gave way to juvenile court criminal defendants’ right to confront witnesses and present exculpatory evidence. The legislature, the Court counsels, is free to amend the law if it believes a change is warranted or that it has been misunderstood. Until then, clients are well advised to be well rested and bring granola bars and water to any mediation. THIS ENTRY IS CROSS-POSTED FROM THE COOPER, WHITE & COOPER LLP WEBSITE AT http://www.cwclaw.com. I am trying to enjoy the Giants game on TV, but sadly, it is on KNTV, Channel 11, which apparently is too cheap to telecast the game in high definition. Unbelievable in 2010. Gigantes deserve better. Until today, one of the most dysfunctional areas of litigation was the apparent requirement that a party who made written objections to evidence offered in a summary judgment proceeding had to force the trial judge to rule on the motions or was deemed to have waived the objection. Aside from the questionable statutory basis for this rule, as a practical matter, the result often was a tense confrontation between the attorney, who was forced to press for a ruling in order not to waive the multitude of objections that had been made on paper, and the trial judge, who did not want to spend the time or effort deciding what often was an overwhelming number of inconsequential evidentiary issues. In Reid v. Google Inc. (August 5, 2010) __ Cal.4th __ (Reid), common sense prevailed and the California Supreme Court ruled that (1) objections need only be made in writing, not also at the hearing, and (2) objections are deemed to be overruled if no actual ruling is made, rather than waived. The key distinction between having an objection overruled and having waived an objection is that an objection that has been overruled is preserved for appeal. The genesis of the problem was California Civil Code §437c, subd. (b)(5), which states that “[e]videntiary objections not made at the hearing shall be deemed waived.” and Section 437c, subd. (d), which requires that any objections based on failure to establish a foundation “shall be made at the hearing or shall be deemed waived.” As is recounted in Reid, two competing and confounding lines of cases dealing with these requirements caused uncertainty, annoyance and unjust results. The first line of cases, based on the reasoning of Biljac Associates v. First Interstate Bank(1990) 218 Cal.App.3d 1410, 1419 (Biljac), excused the trial court judge from having to make specific rulings on objections. In Biljac, the plaintiff sought trial court rulings on the voluminous objections he had filed, but the judge refused, calling that “a horrendous, incredibly time-consuming task” that “would serve very little useful purpose.” On appeal, the plaintiff argued that this was reversible error, but the Court of Appeal held that express rulings were not needed because the objections would be renewed de novo on appeal. Under Biljac, it was enough that the judge said the ruling was based only on competent and admissible evidence. However, in two cases that ignored Biljac, the Supreme Court held that if an attorney did not actually obtain specific rulings on objections, the objections were waived and not preserved for appeal. Ann M. v. Pacific Plaza Shopping Center(1993) 6 Cal.4th 666 (Ann M.); Sharon P. v. Arman, Ltd.(1999) 21 Cal.4th 1181, 1186-1187, footnote 1 (Sharon P.).) Under this theory, ostensibly based on a reading of the summary judgment statute §437c, if there was no specific ruling on meritorious objections, the appeal would be decided as if the evidence had been admissible. Chaos ensued, as many courts of appeal disapproved Biljac, some finding waiver, some ruling on the objections and some sending the case back to the trial court to make rulings. A particularly preposterous development, referred to in Reid as the “stamp and scream” rule, required attorneys to avoid waiver by asking for a ruling with sufficient vigor at the hearing, even if no ruling was obtained as a result. See e.g.City of Long Beach v. Farmers & Merchants Bank(2000) 81 Cal.App.4th 780, 783-785. Next, Reid requires the trial court to rule on the motions, but holds that if no ruling is obtained, the objections are deemed to be overruled. Contrary to Ann M. and Sharon P., the objections are preserved for appeal and are not waived. Surely, this is the ruling for which all litigators had hoped. Summary judgment hearings had become needlessly tedious and were not focused on the key issues. Moreover, at the same time an attorney was trying to persuade a judge on the merits, the attorney also had to annoy the judge by pressing for evidentiary rulings. Any summary judgment motion contains many more points than can be discussed at a hearing. Now one can focus on the key points without the danger of waiving the ones that are only in the papers. Originally posted on the Cooper, White & Cooper LLP web site. As promised here is a more detailed account of the debate between California U.S. Senate candidate (and my brother) Mickey Kaus and an absent Barbara Boxer, represented by a box. 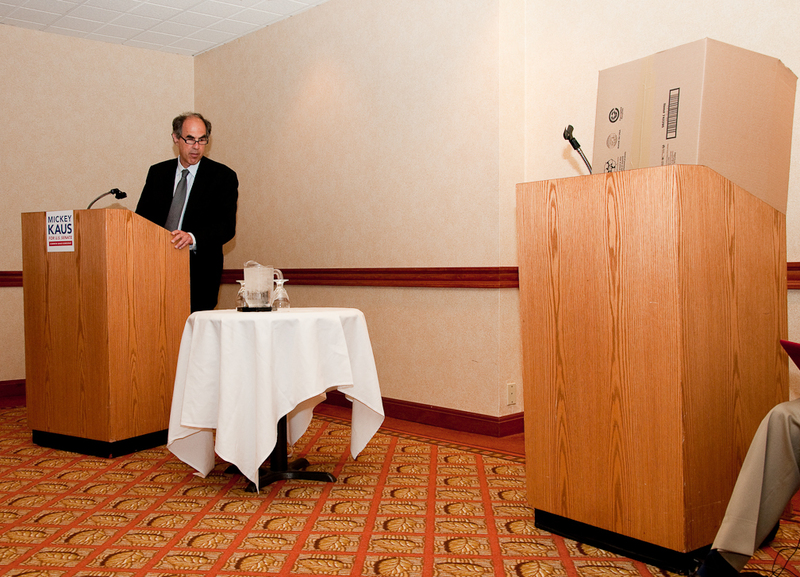 Mickey Kaus debates a box that stood in for missing Senator Barbara Boxer. Mickey was surprisingly convincing on his key points: the need for the Democratic Party to shake free of organized labor and the need to secure the border before addressing amnesty. he also was well informed on issues that are not the basis of his campaign, like North Korea and Israel. A key question concerning Mickey’s campaign is why in the world is he running. Mickey explained that he believes that whatever income inequality may exist, all people are entitled to equal dignity, which requires public institutions that facilitate such equal treatment. Right now, California, and most governmental bodies, are unable to provide appropriate services because their resources are taken up paying unaffordable pensions to workers who retire in their 50s. As the party that considers the government to be the appropriate source of solutions in society Democrats have a special interest in making government work, something that cannot be done if the public employee unions call the shots. Concerning unions more generally, Mickey is not against workers organizing, but he is against unions such as the UAW, that in his view broke Detroit, prevented the innovative work rules at Fremont’s NUMMI plant from being more widely adopted and then saw to it that the NUMMI plant was then a casualty of the financial crisis. A tape of Senator Boxer expressed her support for teachers unions and expanding school budgets. Mickey believes that the contracts negotiated by teachers unions have prevented public schools from improving. The worst teachers cannot be fired. in the L.A. unified School District, which employs 33,000 teachers, only 4 teachers have been fired in contested proceedings in the past 10 years and an average of 21 are let go each year for incompetence. Moreover, when there are budget cuts, the newer, more innovative teachers must be let go, not the ones with poor performance, Charter schools and other innovative ideas need to be tried. California will never receive “race to the top” funds from Washington because the unions won’t agree to the required reforms to the California education system. On immigration, Mickey sees amnesty without securing the border as an invitation for another 12 million immigrants to come across. If we allow open immigration, Mickey asserted, L.A. will be like Rio, with vast areas of abject poverty. He believes that such a flood of cheap labor depresses wages at the bottom of the ladder to the detriment of Americans seeking entry level jobs, people whom the Democratic Party should be serving. He is not against a path to legalization, just not until we are sure that those already here will be the last such group for whom amnesty must be considered. In the absence of Senator Boxer, Mickey took questions. The first question asked Mickey’s views on North Korea. Somewhat surprisingly, he had some, complete with statistics. He believes that if we are tough, North Korea will back down and the present crisis will be defused. Regarding Israel, he deplored the continued building of settlements to serve a fringe group and urged the United States to demand that Israel take the steps necessary to move toward peace. The Arab world has to see the United States as an actor independent of Israel. On more familiar territory, Mickey asserted that as a way out of our budget dilemma, social security needs to be indexed, so that those with ample income receive less. All in all Mickey did an impressive job. In another universe, Senator Boxer would have shown up along with television cameras and reporters, and the public would have a choice. I am not so sure that they would not pick Mickey.